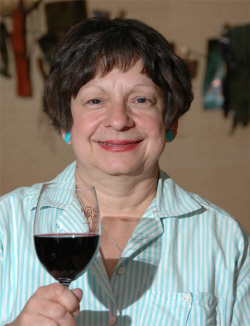 Anne Vercelli is a teacher, organizer and leader in the world of wine and food. Vercelli has been with the Cloverdale Citrus Fair/San Francisco Chronicle Wine Competition since 1989. As SFCWC Assistant Director, Anne is responsible for assisting in all aspects of the competition. Her responsibilities include the receiving and coding thousands of wines received each year. She supervises a staff of 125 volunteers throughout the competition season. Anne also directs the volunteer work force with the public tasting event at Fort Mason Center every year in February. Bob Fraser states. “Anne Vercelli is my right arm when it comes to planning, organizing and implementing the wine competition and public tasting. We work seamlessly along with our management team and she is my sounding board in raising the bar for excellence from year to year. Anne has a strong work ethic and dedicated toward the San Francisco Chronicle Wine Competition”. For over 20 years, Vercelli honed her skills in the food and wine industry In 1981 she began teaching Italian cuisine in the culinary department and wine classes in the agriculture department at Santa Rosa Junior College. In 1982, she started working as the coordinator of the Professional Food Competitions for the Sonoma County Harvest Fair, which included hiring and directing six people in support of the competitions. In addition to her teaching and coordination duties, in 1998 she started working as a sales staff associate at Costeaux Bakery in Healdsburg. She is part of the team that has propelled the bakery into a nationally acclaimed establishment that offers delicious breads and desserts in a delightful open-air cafe. The winner of numerous awards, in 1979 she received the coveted position of “Fellowship” of the Escoffier Room Restaurant at the Culinary Institute of American (C.I.A.) in Hyde Park, New York. She obtained her A.O.S. degree from C.I.A. in 1979. Later in the year, Anne represented the C.I.A. as the principle cook for Mr. Edgar Bronfman, Chairman of the Board of Seagrams in New York City.